Millions of tweets, likes and online posts are the new political lawn signs. 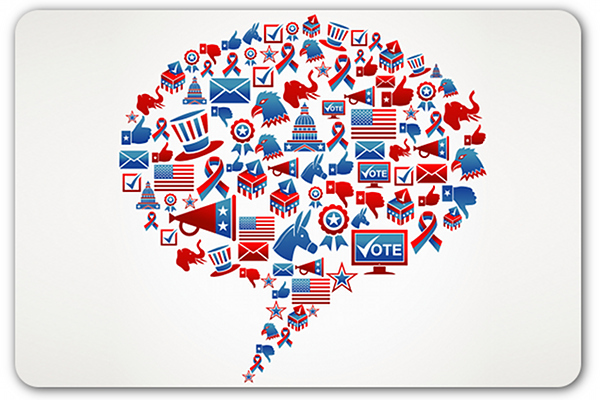 From the debates to Tuesday’s election, the country took to social media as the preferred outlet for political commentary for the 2012 general election. There were 10 million tweets during the first presidential debate, and Twitter’s own election coverage feed @gov said 20 million tweets were posted Tuesday using the #election2012 hashtag, making it the most tweeted political event in US history. As the television networks called the race for President Obama, @gov reported a stunning 327,453 election tweets per minute. And the most retweeted missive ever came from the @barackobama feed, saying simply “four more years” and attached a TwitPic of the president hugging the First Lady. As people lined up at the polls on Tuesday, @gov’s #twindex showed that Obama was the most-tweeted-about candidate in every swing state: 40 percent of national tweets to 24 percent for Romney, reversing the trend of recent days. HootSuite’s 2012 Election Tracker followed 6 million mentions for both Obama and Romney and 44 million Facebook “likes” as polls closed. Also, apparently quantity was more important that quality on Twitter in terms of Twitter buzz. Social media monitoring firm SocialBaker tracked a minute-by-minute “cheer meter” showing Obama mentions outgained Romney mentions, but overall mentions of the two candidates falling off on Election Day. Adding further proof to the strength of this social media election, a survey by journalism think-tank Pew found that 22 percent of registered voters announced their vote early on a social networking site, and about a third of people between the ages of 18 and 29 offered tweets or Facebook updates with their presidential choices. Author: Gil Rudawsky - is a former reporter and editor. He heads up the crisis communication and issues management practice at GroundFloor Media in Denver.